Tino Productions was honored to perform at the 20th anniversary gala for the Latino Health Services sponsored by many organizations, including the Walt Disney Company and the California Healthcare Foundation. There were many executives from healthcare companies that attended the event and danced the night away! The event was held October 5, 2013 at the Disneyland Hotel and, besides the entertainment, also offered a silent auction, a no host bar and dinner. The event proceeds were for programs that encourage community involvement to improve the quality of life for uninsured people. The band was a huge hit. Many people brought out their dancing shoes for the night! Guests were very pleased with the variety of music from salsa to merengue to disco and more. The performance of Tino Productions kept the venue packed until the very end of the evening surpassing the expectations of the event coordinators, as in past events most people left after dinner was completed. Insight to the night described below by both a guest, and Tino himself! 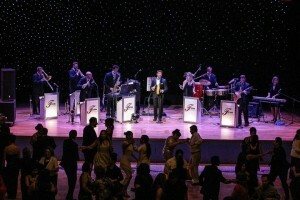 Looking for the right mix of fun and professionalism for your next big corporate event or gala? Contact Tino Productions for fun and flavor in the LA & Orange County area.